The Wellfleet® Five Point Breastplate is ergonomically designed with the horse's anatomy in mind. Keeps your saddle secure over obstacles while maintaining your horse's comfort. This breastplate features padding in all of the right places, genuine sheepskin discs, and an adjustable running martingale attachment. The superb craftsmanship is shown in the combination of the finest English bridle leather, extra fine stitching, and durable hardware. Available exclusively at SmartPak! Wellfleet® Five Point Breastplate by SmartPak is rated 4.7 out of 5 by 12. Rated 4 out of 5 by ptejhe from Great product...bad fit! This is a beautiful breast plate, but the fit on our 9 year old OTTB gelding is terrible. The strap that runs from the chest to his girth is SO long, even going as short as we could. Probably just his conformation, but didn't fit him. I really wish it did because it's gorgeous! Rated 5 out of 5 by JLEventing from Wonderful breastplate! Runs a bit big otherwise! I got this about a three weeks ago. It is very nice quality and I do really like it! It matches my Wellfleet Monocrown Bridle super well and the leather quality is definetly noticeable! My only complaint is it runs large. I have an appendix and went for the cob, but it is still going to need some hole punches! despite fitting his neck and withers well, the bottom is just two long. I would recommend sizing down a bit if you can! Otherwise, this is a GREAT product and probably ranking one of the nicest five points I have seen. I cannot wait to show in it this upcoming season! Rated 5 out of 5 by Andyjane7 from Love this! Great product, love the material, well made, takes oil very well. Does run very large - I ordered the full for my big 16.2 massive shouldered OTTB and it was huge on him. The cob fits him well, though it is still tightened almost all the way! Rated 5 out of 5 by Aimeeleigh from I love it, but it's not what I was expecting... 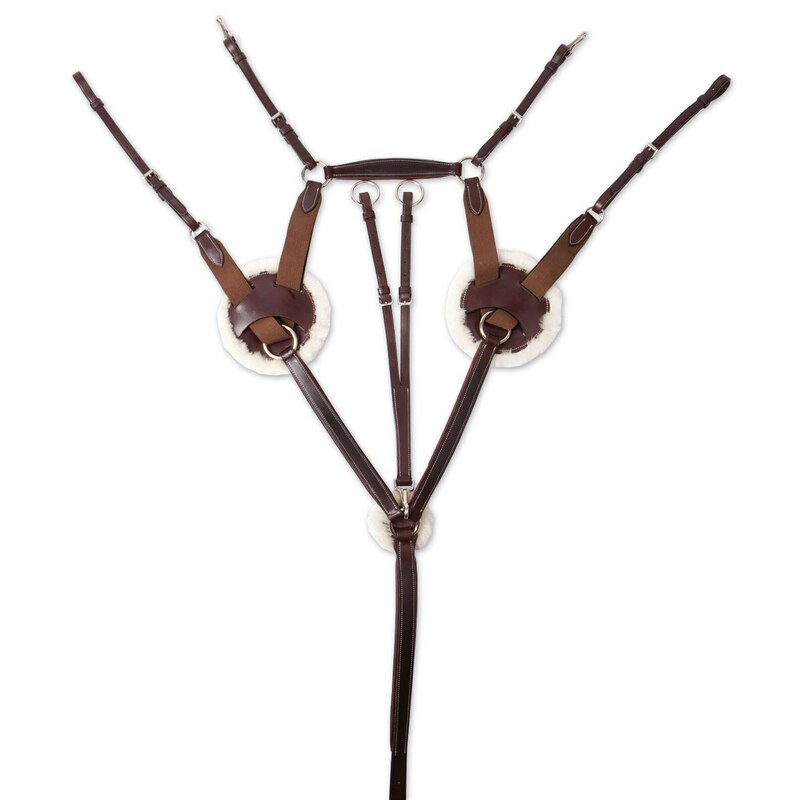 If I had bought this before my Wellfleet bridle, I would be beyond thrilled with this...it's gorgeous and the materials are top-notch (a touch too big for my skinny 17+ hh TB but nothing a good hole punch didn't fix!). But I bought the Wellfleet bridle at the store a few days before this arrived in the mail - the bridle oiled up to a stunning mahogany color with dainty stitching, but this is solid, dark, and very plain in comparison. I guess I was hoping these two pieces would match...still, I love this piece and will happily use it for schooling! Rated 4 out of 5 by ottbjumper06 from Very Nice.... But Runs Large I got bought this last Christmas when it was on sale and I have to say I'm impressed! The leather is nice and supple once you break it in and I love the sheepskin discs, although I do wish they were removable for cleaning purposes. I bought the Horse size, and everything fits well on my feminine 16h TB mare except for the piece that clips on the girth which I had to punch several extra holes for. It does however doan awesome job of keeping my saddle secure over fences. It also didn't like to accept oil when I first got it, but worked out of that fast. All in all a very nice product, but I wouldn't pay full price for it. Rated 5 out of 5 by OTTBlover06 from Wow... Just Wow This breastplate... it has so many things going for it, it got the looks and durability. I bought a full, and it fits my fine boned 16 hh OTTB mare with a little adjustment which I expected because of my horse's build. Yes it's expensive, but I got it on sale and paid just a little more than I would have for the Ovation breastplate. The leather quality is great but I recommend oiling it well before the first use. The padding is a nice touch. Overall very nice product, Smartpak has outdone themselves once again! Rated 5 out of 5 by WIeventer from Great Product - even better Customer Service! We purchased the Wellfleet 5 point breatplate and made the mistake of ordering a horse instead of a cob. While with a lot of jury rigging even that fit and worked great, we contacted Smartpak to ask to return it for a cob... you of course said "send it in"... and now the cob fits like a glove, my horse loves it and it works like a charm. So it's an unbeatable combination - A Great Product and Even Better Customer Service! !